^ 1.00 1.01 1.02 1.03 1.04 1.05 1.06 1.07 1.08 1.09 1.10 1.11 Graves' Disease. www.niddk.nih.gov. August 10, 2012 [2015-04-02]. ^ 2.0 2.1 Management of graves disease: A review. JAMA. 2015-12-15, 314 (23): 2544–2554. ISSN 0098-7484. doi:10.1001/jama.2015.16535. ^ 3.0 3.1 3.2 3.3 3.4 Brent, Gregory A. Clinical practice. 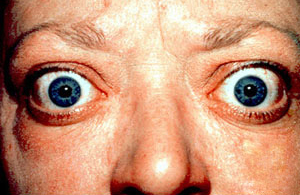 Graves' disease. The New England Journal of Medicine. Jun 12, 2008, 358 (24): 2594–2605. ISSN 1533-4406. PMID 18550875. doi:10.1056/NEJMcp0801880. ^ Menconi, F; Marcocci, C; Marinò, M. Diagnosis and classification of Graves' disease.. Autoimmunity Reviews. 2014, 13 (4–5): 398–402. PMID 24424182. doi:10.1016/j.autrev.2014.01.013. ^ 5.0 5.1 5.2 Nikiforov, Yuri E.; Biddinger, Paul W.; Nikiforova, Lester D.R. ; Biddinger, Paul W. Diagnostic pathology and molecular genetics of the thyroid 2nd. Philadelphia: Wolters Kluwer Health/Lippincott Williams & Wilkins. 2012: 69. ISBN 9781451114553. ^ 12.0 12.1 12.2 12.3 Jerome M. Hershman. Hyperthyroidism(Thyrotoxicosis). Merck & Co., Inc. [2011-11-25] （英语）.